The global network traffic analysis solutions market was valued at US$ 1,527.6 Mn in 2017. It is anticipated to expand at a CAGR of 15.2% during the forecast period. Rise in the number of connected smart devices and increasing IT security budgets are expected to be major drivers of the network traffic analysis solutions market. To minimize/eliminate the chances of cyber-attacks, various organizations are compelled to increase their IT spending on advanced network security solutions. The market is also expected to receive a boost from advancements in the field of cyber security and rise in the number of smart city projects. Furthermore, migration toward cloud computing is expected to drive the market in the next few years. Cloud-based solutions require managed services, which is directly eliminating in-house IT support. In addition, growth of micro, small, and medium enterprises (MSMEs) is a key factor that is expected to fuel the network traffic analysis solutions market in the coming years. Unlike large enterprises, SMEs do not have in-house IT capabilities and are thus dependent on service providers for their security, communications, and IT requirements. However, the market is expected to be hindered by concerns over data security due to vulnerable networks with infrequent security updates. Moreover, the market is expected to face restraints as the bring your own device (BYOD) movement is gaining momentum. With more new countries/regions set to announce their 5G plans, the industry is expected to witness tremendous growth in the 5G market as well as in the total amount of data generated. The global network traffic analysis solutions market is expected to be driven by the North America region. North America is estimated to constitute a major market share during the forecast period, with the U.S. contributing most to the region’s revenue. North America is expected to hold about one third of the global market share in terms of revenue. Presence of major industry players in the region and high adoption of network traffic analysis software across many verticals are expected to drive the market in the region. The presence of necessary Internet and communication infrastructure is also expected to bolster market growth. North America is also helped by the rapidly expanding cyber security industry owing to increased cyber-attacks.The region is projected to be followed by Europe and Asia Pacific in terms of market share. 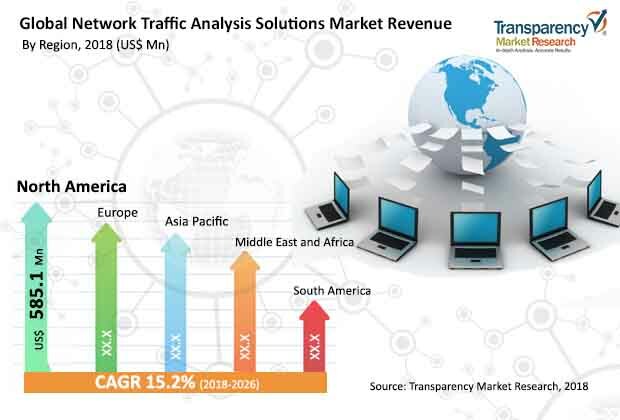 Major players operating in the network traffic analysis solutions market include GREYCORTEX s.r.o., Genie Networks, Flowmon Networks, Zoho Corporation, Hewlett Packard Enterprise Co., Ipswitch, Inc., Cisco Systems, Inc., Bricata, Inc., CA Technologies, Palo Alto Networks, Inc., Netreo Inc., Dynatrace LLC and Netmon Inc.
Based on end-use industry, the market has been analyzed for two major categories:enterprises and service providers. The enterprises segment is further sub-segmented into BFSI, government, healthcare, energy & utilities, education, manufacturing, retail, and others (media & entertainment, aerospace & defense, and hospitality). The service provider segment is further split into telecom service providers, internet service providers, internet data center service providers, managed service providers, cloud service providers, and others. The above detailed analysis of the market has been provided for the following geographic segments: North America, Europe, Asia Pacific (APAC), Middle East & Africa (MEA), and South America. Across each of these regions, top-line market estimates for the U.S., Canada, U.K, Germany, France, Russia, China, India, Japan, Australia, GCC, South Africa, and Brazil hasbeen included within the research scope. To further support market analysis and help build deep understanding of growth dynamics, the report provides the following analyses –Internet Traffic Analysis, 2017 and 2021, active internet users (%) by region, regulations and policies – by region, case study/ use cases- network traffic analysis solutions deployment,Porter’s Five Forces Analysis, PESTLE analysis, network traffic analysis, solutions ecosystem analysis, market attractiveness analysis, network traffic analysis solutions, market concentration rate,and competition matrix providing matrix of competitive positioning of key players as per select parameters. The market sizing methodology adopted involved a multi-pronged approach, ultimately resulting in data being triangulated from all models/approaches. Primary focus has been on analyzing information as retrieved through the primary approach which required interaction with industry experts. These included professionals across companies involved at various stages of the ecosystem/supply chain. Data heads such as internet traffic analysis, active internet users by region, capital expenditure trends, technology hurdles and outlook, and key market developments were some of the parameters modelled based on inputs received. These were simultaneously also verified against information collected through different secondary sources. Major sources include company annual reports, analyst briefings, technology white papers, industry magazines/publications, expert blogs, and paid secondary databases. Apart from data aggregated from these models, the process also involved analysis against available in- house repository and expert panel opinion. The analysis included in the report has been developed based on a study of key performance parameters of companies active across the ecosystem, with service providers making up the majority of the list. Some of the players/companies which were subsequently profiled and included in the final report draft include GREYCORTEX s.r.o., Genie Networks, Flowmon Networks, Zoho Corporation, Hewlett Packard Enterprise Co., Ipswitch, Inc., Cisco Systems, Inc., Bricata, Inc., CA Technologies, Palo Alto Networks, Inc., Netreo Inc., Dynatrace LLC, and NetmonInc. In addition, the report provides analysis of the network analysis solutions market with respect to the following geographic segments, detailing the above given segment level analysis for all countries/regions.